This is a little post. 1. Before you address the ball, feel a fast, smooth, effortless swing in your mind. 2. Hold the club LIGHTLY at address. Relax everything else, too. 3. Think that it is the sole of the club that is moving fast, not your body, your arms, or your hands. 4. Relax even more during the swing. Remember, though, you do have a red line. The key to distance is hitting the ball on the center of the clubface. Never swing faster than you ability to keep doing that. A few years ago, I published a post about a move that let me hit a 9-iron 145 yards. This all started when I asked my teaching pro how to make sure I hit the ball first and the ground second. He showed me a move, and I talked about it in that post. Now, after almost eight years, I’m going to reveal what that move is. It’s very simple to do, but does take lots of practice to get right. It’s a Johnny Miller move he calls covering the ball. If you go on YouTube and search for “covering the ball,” you’ll find several ideas about what that term means. One of them is to keep your chest over the ball, i.e., “cover” it, through impact. I won’t argue with that, but that’s not what I’m going to talk about here. I’m going to use Miller’s definition, which is “the act of angling your right palm toward the ground” as the club comes through impact. Instead of facing the target directly, the right palm FEELS like it is angled slightly toward the ground, hence “covering” it with the palm of your right hand. You don’t PHYSICALLY turn the palm down to cover it unless you want to hit a great big hook. What you will get by applying this feeling is a de-lofted clubface which will send the ball farther. And straight. 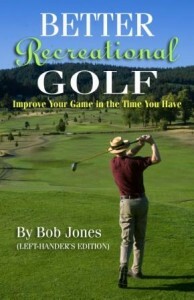 You will also get the ball first, ground second contact that is the key to good golf. It will take some experimentation to figure out how to do this. I would suggest getting into an impact position with a feeling of the right palm being angled down, but with the clubface still square to the swing path. (Hint: Your hands have to be ahead of the ball.) Then work the swing, always starting in this position, making bigger and bigger swings, slowly, that keep arriving back to this position. IMPORTANT POINT: DO NOT do this when the ball is on a tee. Ground only. 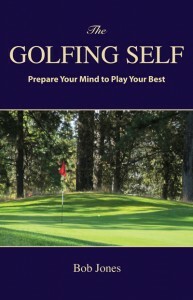 The Miller quotation is from his book, Breaking 90 with Johnny Miller. Those of my readers who have been around for a few years remember my displeasure with the anchored putting ban. Search the tag “anchored putting” to read about that. There’s no point here in going over plowed ground. You can still anchor your stroke, though, and I do it to great effect. I was doing it long before the ban. 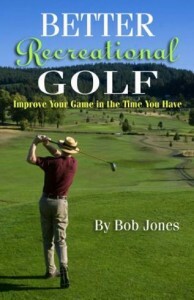 I putted then, and now, really well with it, and it is the foundation of my putting stroke. What I do is bring my upper arms in contact with the sides of my torso. Light contact, not pressing. Pressing would make it almost impossible to move the putter. Just light contact so the upper arms stay in contact with the torso the whole time–slide over it, if you will. That’s how I anchor my stroke. If my upper arms ride free in the air, they can go places they shouldn’t go to. By letting them slide freely in contact with my immovable body, they are guided along a predictable path consistently. Combine that with a putting grip that does not allow my hands to wander, and I have the greater part of the stroke pretty well taken care of. This anchoring gives me a mental boost, too. It creates a feeling of security that prevents any worry about moving the club from creeping in. I can concentrate on the only thing that is important–the ball going into the hole. Anchoring works, or the USGA wouldn’t have outlawed it. This way of anchoring works, too, and it is legal.